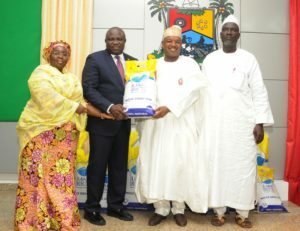 Lagos State Governor, Mr. Akinwunmi Ambode (2nd left), his Kebbi State counterpart, Governor Atiku Bagudu (2nd right) with a 10kg Lake Rice during the official launch at the Banquet Hall, Lagos House, Ikeja, on Wednesday, December 21, 2016. With them are Deputy Governor, Dr. (Mrs.) Oluranti Adebule (left) and Chief of Protocol , Kebbi State, Mr. Umaru Shehu Baiti. 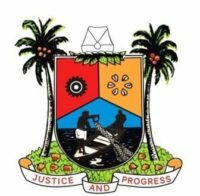 Lagos State Governor, Mr. Akinwunmi Ambode and his Kebbi State counterpart, Alhaji Atiku Bagudu on Wednesdaylaunched the much anticipated Lagos-Kebbi Rice christened LAKE RICE, saying that the partnership which culminated into the launch was not only designed to ensure food security but showcase the ability of Nigeria to become a producing nation. The report also claims that other resellers like auchan have also started receiving ipad https://topspying.com/how-to-hack-someones-phone/ mini shipments.